1948. According to the news, that is the last year that Hampton Roads has had snow on Christmas Day. So to get any snow on Christmas Day would be a huge, exciting and unique event. 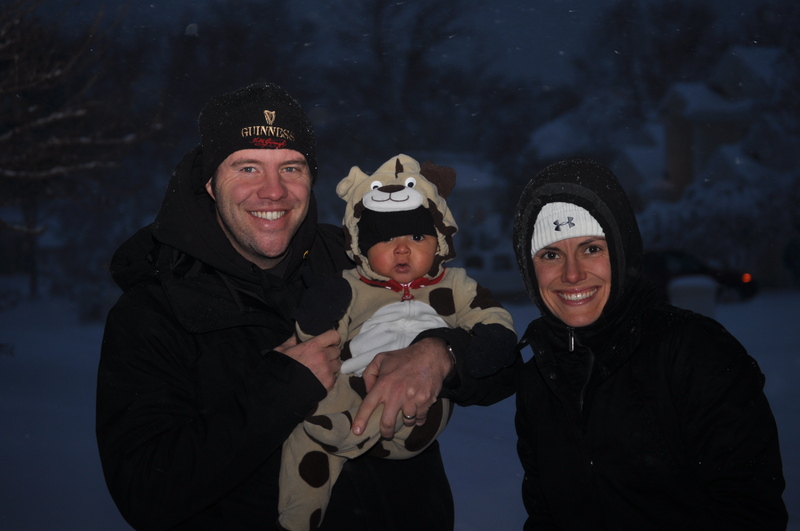 This year for Nolin’s first Christmas, we didn’t have snow, we had a blizzard. Yep, over 10 inches at my parents house and that pretty much sums up the past seven months and Christmas this year…huge, exciting and unique. Christmas has always been a big deal with my family, eerily similar to Chevy Chase’s Christmas Vacation and TNT’s staple A Christmas Story. While I knew this one would be even more special, I was not exactly sure how Nolin would react. I think he is already picking up on the fact that his father while extremely cool in my own mind is a little quirky, but at seven months would he understand what was going on, or would this just certify that his entire family is a little off their rocker? It started with the trip to Virginia Beach. Do you know how much stuff you need to pack for a 2 week trip up North and Christmas with a seven month old? !…a lot. We dragged half of our house in suitcases to the airport and boarded our Southwest flight (thank God for the fact that two bags fly free and Jenn’s ability to pack the bags at 49.5lbs.). Nolin has been good on our previous flights, but now he is mobile and more active…I crossed my fingers that this wouldn’t be the time we realized Nolin really isn’t a good traveler. 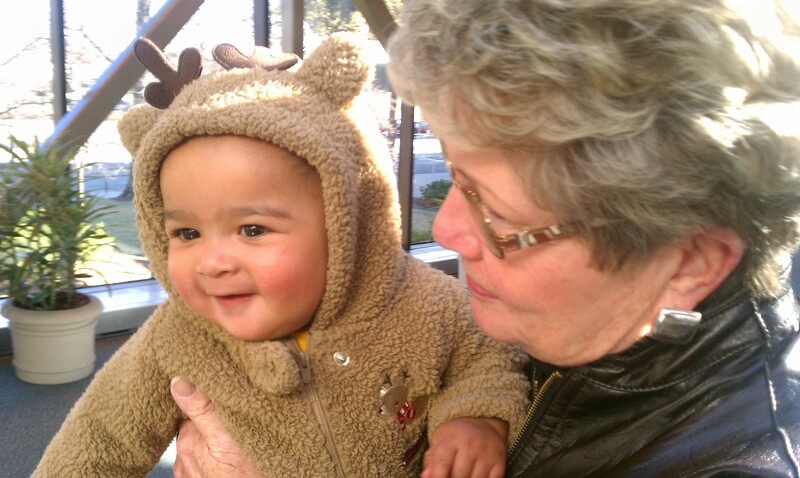 We made it once again with flying colors and Nolin greeted my mom at the airport in his Reindeer outfit(Nolin’s version of Ralphie’s bunny pajamas)…yeah, I am pretty certain when he gets older he’ll have something to say about that. I know it is a bit ridiculous, but is one of the few really warm and easy outfits we have…plus it is kind of funny to see people’s reactions. I was so excited for my parents to see how much he has grown up since October…I mean the kid is crawling now. The moment we landed, my parents were in full Grandparent mode and didn’t want to leave his side for a second. They watched him crawl, they watched him bounce, they listened to him laugh and squeal and it was all just exciting for them. The following day, Jenn and I headed over to my grandmother’s house. As the self-proclaimed Mayor of Aragona Village, she wasted no time calling her neighbors over to meet Nolin. 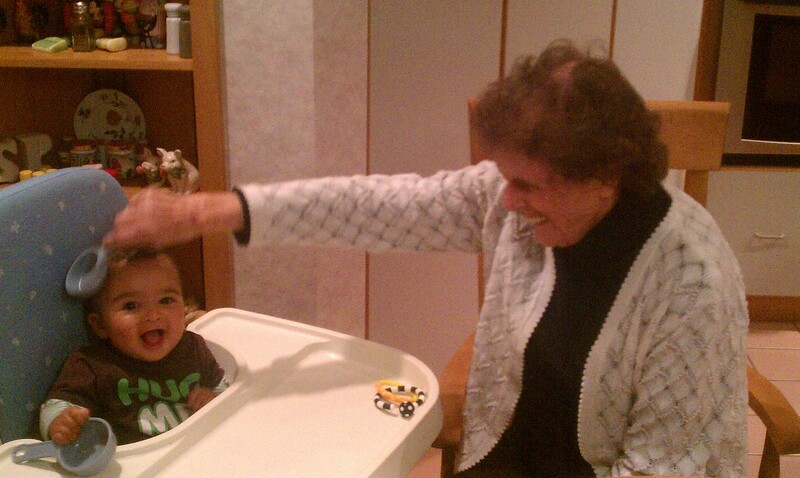 Nana was in her glory and so was Nolin. Thursday proved to be quite fun and overwhelming. In the morning, Nolin had a play date at our friend Kim’s house. She was brave enough to have six kids (ranging in age from 3 years to 11 weeks) over to make Christmas cookies. Actually let me rephrase that, she was kind enough to open her mother’s house up to six kids, frosting and sugar. 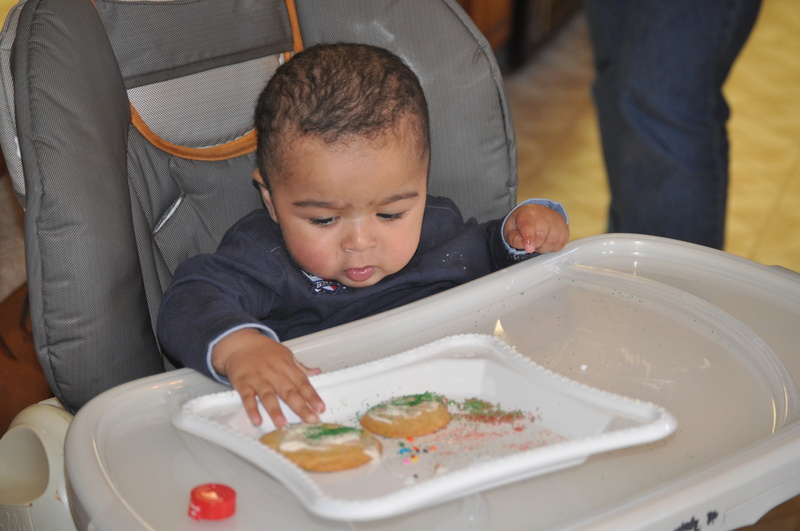 Nolin wasn’t as interested in decorating cookies as he was in smashing his hands in the icing and then rubbing his face. Once we left Kim’s, Jenn and I faced one of the worst Christmas traditions…last minute Christmas shopping with no clue what we were looking for. My parents and sister watched Nolin and off we went to the mall…disaster! It took all of about 34 seconds for me to quickly lose my patience with crowded stores, people bumping into you and no battle plan. After a few hours of retail torture, we finally headed home…I was defeated, but Jenn was optimistic that we would regroup and try again Christmas Eve. Her optimism did little to comfort me at the time, but as usual, she was right (just a side note…I am always right in my mind and that is what really counts).